What an entertaining match it was! The Belgian Red Devils cruised past their opening game opposition in the FIFA World Cup. Belgium defeated Panama 3-0 and secured their first win in the tournament. Belgium were in total control of the game and were with the most chances and possession. Although Panama lost the game, they showed commendable defensive display by the Central American side in their World Cup debut. Courtios, Alderweireld, Boyata, Vertonghen, Meunier, Carrasco, De Bruyne, Witsel, Mertens, Hazard, Lukaku. Formation: 3-4-2-1. Belgium had complete control in the first half of the match. They started instilling their authority and superiority right from the first minute. They used every opportunity and made most of every chance. Belgium had their first chance in their first minute of the game in which Lukaku missed a pass from Hazard. The captain, Hazard missed three goal scoring opportunities. He showed great ambition to prove himself but was merely too selfish to pass to Lukaku who was wide open in the box. Panama showed great defensive display. 36-year-old keeper Jaime Penedo made some good saves to deny Belgium and Captain Roman Torres also made great clearances and tackles to keep the opposition at bay. Panama were shy in attack but took few opportunities due to a lapse of judgement between Spurs duo Alderweireld and Vertonghen. The half ended 0-0 with Belgium having more than 60% of the possession. Belgium were in full attack mode in the second half and also controlled the game like first half. The first goal came in the 47th minute when Mertens volleyed in a Lukaku header in the back of the net. Panama cracked under pressure ad suddenly were lost and didn’t know what to do. They got 4 yellow cards in the span of 10 minutes. Belgium used this to their advantage and started launching in dangerous crosses to test the Panama defense. Belgium scored their 2nd goal in the 69th minute when De Bruyne latched in a well-timed cross which connected beautifully with Lukaku’s head and into the back of the net. 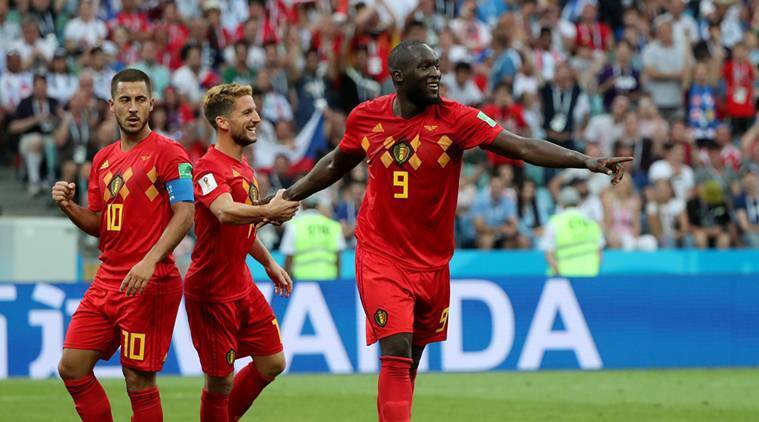 Lukaku went on to score a brace in the 75th minute when a scored through a Belgium counter attack and slotted in a sublime Hazard pass, equalling his goal tally of two goals in the 2014 World Cup. Dembele, Thorgan Hazard and Chadli were the substitutes for Carrasco, Mertens and Witsel. Didn’t have much to do. Kept a clean sheet and made few easy saves. Was solid at the back. Had a few misunderstandings but was solid at the back. Was great at the back and made most of his chance in the absence of Kompany and Vermaelen. Kept a clean sheet. Was good. Made frequent runs and crosses in the box. Used his physical power to win the ball back. Was promising. Wasn’t much involved in the game but tried his best to get into action and made most when he got the ball in possession. Wasn’t much in the spotlight that much. But, controlled the whole game from the middle. Was restricted to attack due to formation but made great passes and created chances and assisted the Lukaku goal. Was great in controlling the game along with De Bruyne. Was great defensively and connected the defensive to the attack. Was splendid in attack. Made great attacking runs and created chances. Was dangerous and scored a brilliant volley to open the scoring. Wasn’t that great in the first half. Wasted few opportunities and was selfish. But had the most chances in the game, assisted Lukaku and made great runs in the box. Scored a brilliant brace. Was hungry to score and prove himself. Had great positional sense and made most of his physical dominance against the defenders. Great start for him in the tournament and a confidence boost for him in his quest for the Golden Boot. Man of the Match contender. Hadn’t much to do. But tried his best to get into the game. Didn’t have much to do was gotten on late. Was got on in extra time didn’t do much.